Chuck Harris began his study of karate at age eighteen, right after graduating from high school. He earned his brown belt after just one year of intense training, four days a week under sensei Jimmy Fulwood. After relocating to Georgia, Chuck found instruction with Jerry Taylor, a senior student of Major Doug Perry. Perry had been appointed the United State representative for Shorin Ryu karate by the style head, Shugoro Nakazato. Chuck Harris continued to train in Shorin Ryu with Jerry Taylor for the next seventeen years, earning the rank of Godan (5th degree black belt). In 2001 he was honored to have been a judge at the all Okinawan World Karate tournament with over 2100 competitors from around the world. He also competed and placed second in weapons. It was during one of Major Perry’s annual summer camps (titled “Little Okinawa”) that Chuck met Jim Logue, senior student of Taika Seiyu Oyata. In 2003 Chuck began studying RyuTe Renmei under Tasshi Logue and eventually earned the rank of Rokudan. Before Jim Logue’s passing in November of 2011, he handed down the KenPuKan dojo to Chuck so that the the teaching and training of authentic Okinawan karate could continue. Kyoshi Kevin Pleasant has been training in martial arts for close to forty years, the last twenty-seven of which have been in RyuTe Renmei. He first started training in Taekwondo in 1974 under Master Tom Caraway in Richland, Washington. Although this lasted for less than a year, his interest was peaked for a lifetime. From 1979-1986, Kyoshi Pleasant trained in Kempo Karate under John Stewart, Randy Wanamaker and James Keating in Kennewick, Washington. 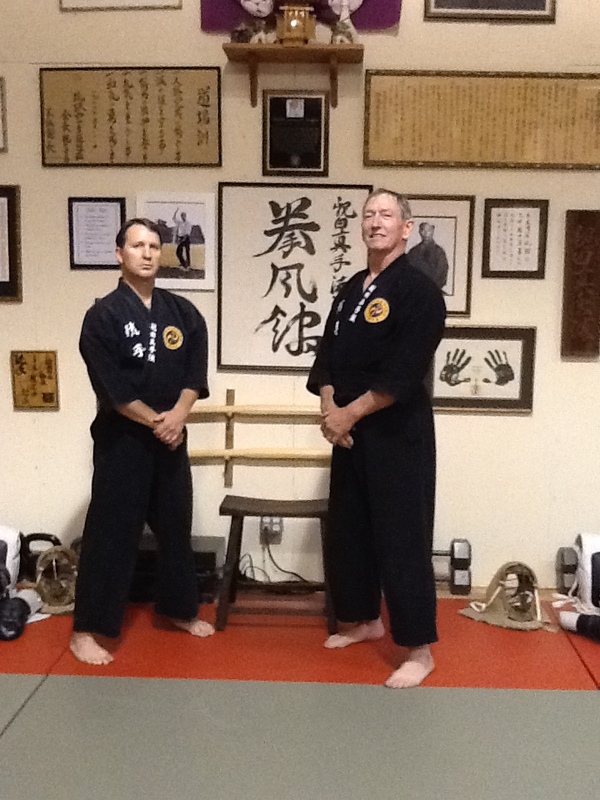 He attained 2nd Dan ranking (second degree black belt) in that system. A cross-country move from Washington State to South Carolina in 1986 lead him to seek new instruction in Ryukyu Kempo (known today as RyuTe Remei, under Jim Logue and Taika Seiyu Oyata. Kyoshi Pleasant has now achieved 7th Dan in both RyuTe and in Oyata’s family art, Oyata’s Shin Shu Ho.